4 Bedrooms, 3 Full bathrooms, 1 Half bathroom, sleeps 8 comfortably! If you enjoy the best, this home is for you! 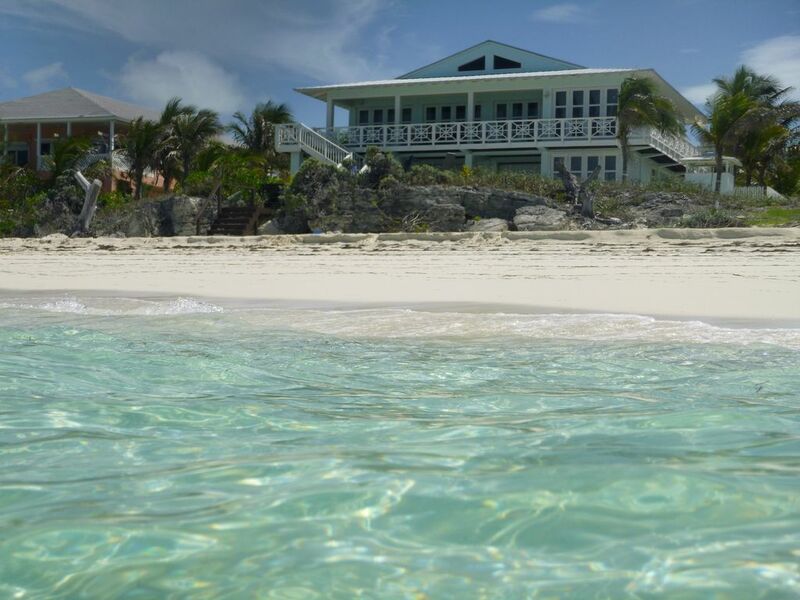 Sugar Palms is a luxurious 4/3.5 home on pristine Great Harbour Cay, Berry Islands, Bahamas. Relax on the large sundeck with a drink at sunset or enjoy the views and sounds of the clear turquoise ocean while dining al fresco on the rear terrace. This retreat is beautifully decorated and includes many luxurious amenities: a large granite island in the kitchen, wine fridge, ice maker, custom artwork, spacious master bathroom with rain shower, reverse osmosis water filtration. The large great room has a dining table that seats 8. The house is equipped with air conditioners & ceiling fans throughout.There is a wraparound terrace and three of the four bedrooms have oceanviews. After a dip in the sea you can shower off outdoors. There is a laundry room with sink, washer and dryer. All the comforts of home in paradise! If you would like we can help you to arrange air and boat charters. Visit us at sugarpalmsbahamas.com. The Island: This beautiful haven offers pristine white sandy beaches, crystal clear turquoise waters, abundant sea life and friendly locals. It is located in the northern end of the Berry islands. There is a large hurricane protected marina, small grocery stores, local restaurants and a paved 5000 ft. airstrip. There are also twice daily flights from Nassau, and charters and shared charters from Miami and Fort Lauderdale. Boat rentals and guides can be arranged. You can also buy fresh seafood and conch salad from the fishermen at the marina. This is an amazing vacation spot whether you want to kick back and relax or have fun in the sun. Truly a special paradise that does not disappoint! Activities and Dining: On the island you can go shelling on the flats on the south side of the island at low tide. This beautiful beach is known as 'Shell Beach'. It is worth a visit just to see it. You can also explore the caves and abandoned hotel on the north side, just a few minutes from the house. There are a few restaurants on the island that serve delicious Bahamian and International food. At certain times of the year you can partake in local festivals and celebrations: every Friday in late June to mid July is Junkanoo, & the first week in August is Lobsterfest. However, if you just want to relax, read a good book or nurse a tropical drink in paradise, this is the perfect place! Fishing and Boating: Don't miss a delicious lunch at Flo's Restaurant, finding the Blue Hole on Hoffman Cay and exploring the spectacular surrounding cays. Percy or Joe Darville are excellent fishing guides and can maneuver you through the flats to bonefish or take you deep sea fishing. There is fantastic snorkeling and sport fishing. Please note only Hawaiian slings may be used for spear fishing. You can expect to catch wahoo, snappers, grouper, yellowtail, lobster and conch. There are slips for rent in Great Harbour Cay Marina if you come by boat, or you can rent a boat at Marina from Elron. Master Bath has a large floated glass enclosed shower with rain showerhead. Outdoor shower with hot and cold water. Well Equipped with everything you need. For any special request please ask to see if we can accommodate you. We can refer for air charters with grocery concierge. We also can provide information on a cook and fishing guides. My family has vacationed in Great Harbor Cay every year for the past five years. However, this was our first stay at Sugar Palms. I so wish we had discovered it sooner! After our first stay, it became clear that this will be our first choice for future accommodations when visiting the island. The home is in an excellent location, very clean, well stocked, has comfortable beds/pillows and has an ideal floor plan for a big family. In short.... The home is perfect in EVERY way and our hostess, Karen, was easily accessible and attentive to all of our needs. We look forward to our return to Sugar Palms. Marlene we are so happy that you enjoyed your stay. We look forward to welcoming you and your family back to Sugar Palms. We enjoyed a great week at Sugar Palms. The owners were helpful and the home was great. Well appointed and exactly as it was represented. We will be back. We would love to welcome you and your family back in the future. We are so happy that you enjoyed your stay. One of the most beautiful locations that i have visited; the house is stunning organized and spotless. The views are breathtaking; truly a wonderful vacation location. Renting homes in the Bahamas can be a shot in the dark but this home is everything as advertised. The decorations and amenities are first rate. Few homes if any are so well equipped from Ice makers to wine coolers. We did not see another sole on the beautiful beach for seven straight days....perfect! Karen runs a very smooth operation here and everything went just as planned. We love this location as it is a true getaway and I would recommend it highly. We loved everything about our stay at Sugar Palms. It was our third trip to Great Harbor Caye and by far the best home to rent on the island. Great location, views, amenities, tasteful furnishings, high quality home, and Alex and Karen went out of their way to make everything seamless. This place is awesome and huge. Other Activities: Information on fishing and boating guides provided upon request. All rentals must begin Monday to Friday. No rentals can begin on Saturday or Sunday. Christmas (December to early January) and Summer (May, June, July, August) rentals have a 120 day cancellation policy.